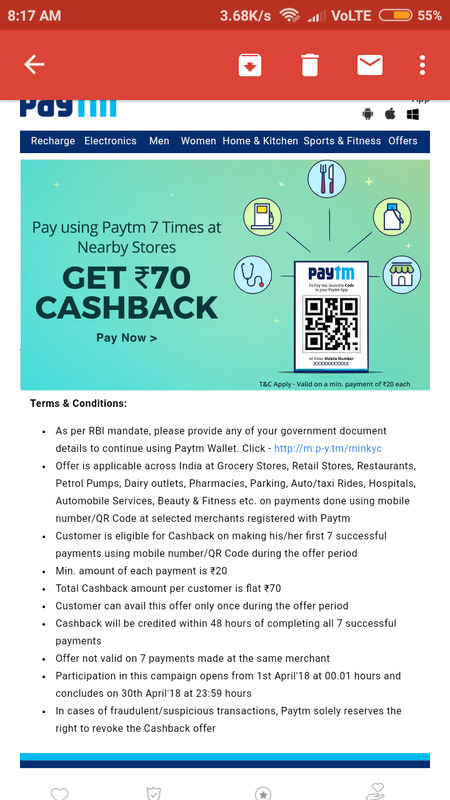 Paytm – Get Rs 70 Cashback on Making 7 Payments using Paytm wallet. If you guys transact on merchants using Paytm wallet. Then, Here is the best offer for You where you will get the Flat Rs 70 Cashback on your Making 7 transaction of Rs 20 each or more. Offer is valid only for Grocery/Retail Stores, Restaurants, Petrol Pumps, Dairy outlets, Pharmacies, Parking, Auto/taxi Rides, Hospitals, Automobile Services, Beauty & Fitness etc. Offer is valid from 1st April to 30th April 2018. So Hurry up ! Deal Credits: Thanks to Nilesh for the Update !! 2) Buy anything of Rs 20 or more. 4) Enter Mobile number/Scan the QR Code to Pay money. 5) You have to complete total 7 payments and Once All the Payment is Successful your Cashback will be credited within 48 hours. 3. Customer is eligible for cashback on making his/her first 7 successful payments using mobile number/QR Code during the offer period. 8. Offer not valid on 7 payments made at the same merchant. Sir.plz tell me if anyone get cashback. ..after 48hrs i did nt get cashback why? keep patience, you will get it for Sure! did you received cashback, i also did 7th transaction by using my own merchant account but still did not get any cashback, already 4 day gone. Bro, PayTM payments bank me kitne bar UPI transfer kar sakta hu din me? Mera Airtel Payments bank k through 20 bar se jyada nehi ho raha h.
i don’t know, But they will accept Grocery Stores, Retail Stores, Restaurants, Petrol Pumps, Dairy outlets, Pharmacies, Parking, Auto/taxi Rides, Hospitals, Automobile Services, Beauty & Fitness etc merchant account for sure! Before offer as well as after offer. Want to clarify some imp facts. 1. Not every merchant is entitle for CB. 2. If you are a merchant and some one applied offer for you that CB will receive only 1 time…it means that if 2 people use offer for one merchant that only one time CB will processed and it processed with that customer who made early transaction. 3. For better results please maintain some gap in each transaction. 4. You should call before the transaction..call will automatically cut after one beep..if you are not able to call, please prefix ZERO. 5. Wait after some time, after calling, you will receive a sms confirming about this offer. 6. After receiving confirmation sms, than go for transaction, each equal or more than 50 Rs. Bhai in t&c saf saf likha h ki 1 hi merchant p 7 transaction ni kr skte.. or savi transaction 1 din mehi ni krna h ye c.care wala btaya.. to genuine tarike se hi use kr skte h.. koi loot ni macha skta..
Sir, isi offer expire date kab hai? Sir , isi offer expire date kab hai? Bro did u done all transaction @same day? I availed this offer in February and got the cashback. Can I avail once again in March? Yes.. This is a different offer !! Bro ak hi din mai sab transaction miye thai? Sir non kyc account mein balance kaise add kare? Agar mene March me ye offer use kar li he to is month me fir se karuga to Cashback aayega??? All paytm user ke liye hai kaya sir . Bhai ye mere me q nahi dikhaa raahaa…mere paas paytm me 5 account hai…kisi me bhi ye nahi dkhaa raaha..lekin dost ke account oe dikha raha hai…kya ye account specific hai? ?